Due to crap weather mixed with work, my crap back and other commitments, it’s been ages since I’ve been out on the beaches, so on Friday night, I went out to Seaford beach to fish the tide up from the 8pm low water. Once on the beach, I checked out the conditions which didn’t look too favourable. The sea was flat apart from small wavelets on the shore line, wind wasn’t doing much either. Water was clear with some colour in it. Two rods deployed, one with a size 4 sole rig baited with black lugworm and the other with long link running ledger, terminating in a 6/0 baited with squid (I did want fresh mackerel but was busy yesterday and couldn’t get any). Two cups of muddy coffee and two hours passed by before I got my first bite of the night – a couple of sharp taps followed by slight trembling on the rod tip. 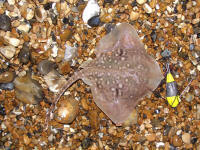 On retrieval, the culprit was identified as a small (and I mean small) thornback ray (pictured). Not exactly what I was looking for but at least it saved a potential blank and it’s another one crossed off the species list. Next up was a small bootlace/snotty eel which luckily was only lip hooked, so I could shake the bloody thing off and release it before too much damage was done to the rig. A short time later, I had a terrific pull down on the worm rod and once hooked, it seemed like a bit of weight on the end. 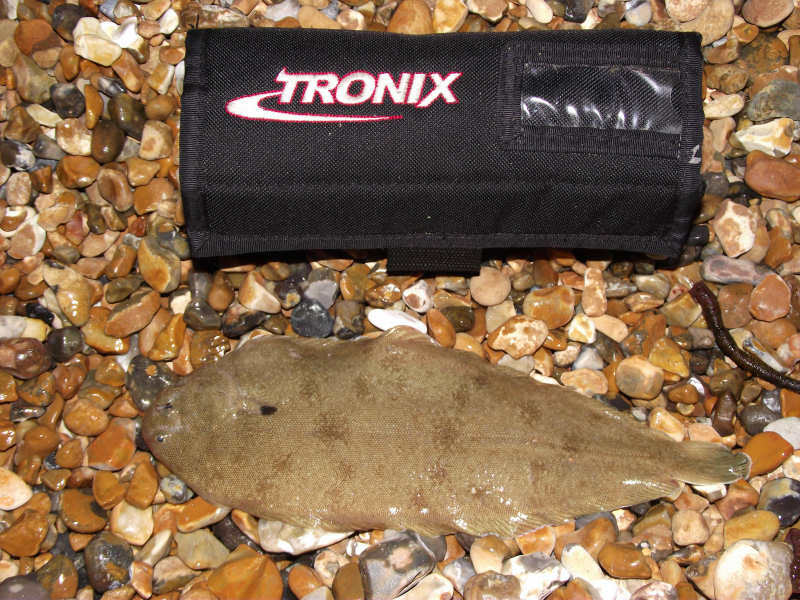 As it reached the waters edge, any hopes I had of a decent flattie were completely shattered when it turned out to be a whiting – a decent sized whiting I’ll grant you but still a bloody whiting, in July? At this rate, it would seem we are going to be plagued by a resident, all year round whiting fest – oh deep joy!! Anyway, I gave it another hour so before calling it a night with nowt else showing up, not even the slightest of twitches on the bass rod. My mojo is currently spiraling downwards but to be fair, I haven’t put in as many hours as I normally would due to other things needing my attention. Hopefully once all is settled, I’ll be back out with mucho gusto! 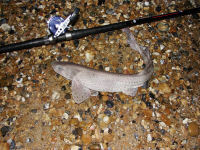 I was out again last, night over at Seaford beach in search of a decent fish. So after work, I shot off home, prepped my gear (should have done it earlier in the day), loaded up the car and got over to the beach at about 9.30 – an hour (ish) after low water. After some thought, I decided to fish up by the boats where the lack of major street lighting makes it somewhat darker than the busier stretch further West along the beach. It also tends to be quieter, with not that many people fishing it, compared to the other areas. I’d heard that a few sole had been caught recently and I was itching to get my first of the year, so the plan (if you can call it a plan) was to use two rods, one as a sole hunter but with its secondary purpose being a bait gatherer, because if I could get any pout, they would be going out as a live bait. So bait wise, it was cheap enough – a couple of wraps of black lugworm and that was it. Anyhow, I had the worm rod rigged, baited and cast out within a few minutes of arriving and then turned my attention to the getting the bass rod sorted out and ready. It really was a lovely night to be out – really warm, with no hint of a breeze and quite humid. It was the first night I’ve fished this year without having loads of layers on and was an absolute pleasure being able to be out in just a polo shirt (I now also wear jeans after being warned by the magistrates… lol). The sea was perfectly calm but did have quite a heavy swell running. With the bass rod ready and waiting, I turned to the other rod and saw some trembling at the tip; I’m not sure how long it had been doing that, so thought it better to bring it in anyway. 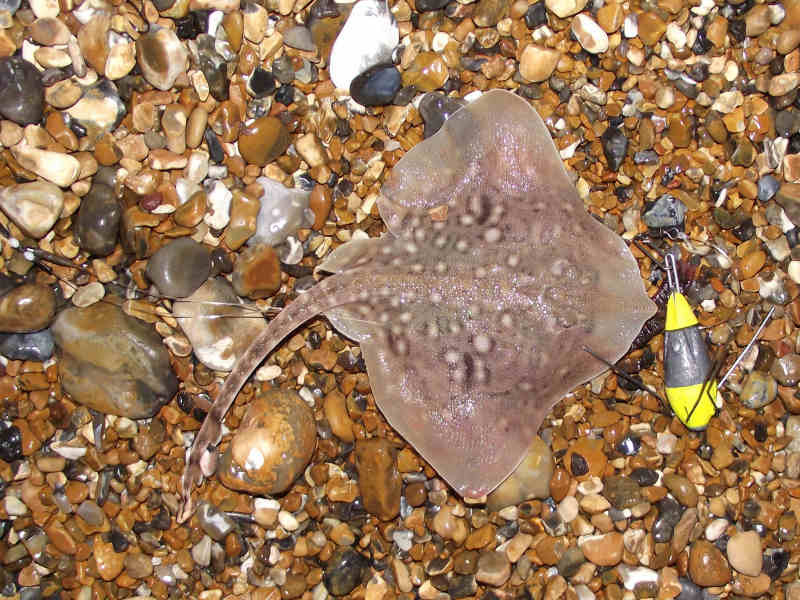 On hitting the beach, I saw that the rig had done its work well and there was a double shot of a pout, which was plopped into the waiting bucket of sea water and a nice table sized dab (not as in the size of a table but of a size big enough for the table…. just in case you were wondering). I cast the bass rod out about ten yards or so, let the lead settle and grip before putting on the slider, hooking the pout and letting it slide out into the water. I then worked the rod a couple of times to work the bait out a bit further before putting the rod in the rest and started the waiting game. Now I know what some of you are thinking and yes I agree, I should have had a bucket of pouts already with me, so it would have just been a matter of sliding them out and then going into silent mode while waiting for the hit. BUT… I had no time to get pouts before I went, so had to resort to the way I did. In my own defence, I would say that this wasn’t a proper stalking live bait session, more of a “If it works, great if not, never mind”. Ten minutes later, a double shot of pout was brought in and took up residence in the bucket that the previous occupant had just left. For the amount of time I was going to be there, that should have done but I do like the security of having a bit more bait than I need – just in case. It then died for about an hour, with nothing moving apart from the usual beach fox that was again hanging around in vain hope of a quick and easy meal. An hour later, almost to the minute, the rod tip stared quivering and another pout was in the bucket. The first one had not done anything worthwhile, so was replaced by one of the twins which also did bugger all before being substituted by the other one. So I had one out and one in the bucket – sorted. 30 minutes later saw a double shot brought in that were surely less popular than the Krays – a bloody whiting and rockling – has no-one mentioned to them that we’re almost into June FFS! Whiting was not a bad size but only a fraction under the MLS at about 24cm and certainly bigger than a pin. Next in was another whiting of similar size to the first. Next was another double shot of whiting that were pins. I was beginning to wonder about packing up and saving what worm I had left for another session over the weekend. In the end though, I decided on another chuck and if it was pins or pout, I’d jack it in. So I launched the worm sections out and sat back on the shingle by the bass rod and drank the last of my ‘mud’ coffee. We were now four hours into the flood and it was in that sort of dead period that happens until things pick up again around high water. I was still thinking about packing in when I saw the rod tremble and nod twice before going motionless for a few seconds, when it suddenly went ballistic, jumping and rattling around. I retrieved the rig and at first thought it was a good dab when it was in the waters edge but then saw that it was a sole – my first of the year woohoo! Admittedly it was small but at lease it was another one to tick off the list. Needless to say, the thought of packing up had now gone and more worms were sent out. Apart from a few more whiting, that was it for the evening. I might of had more luck during the hour after high water but to be honest, by now, I’d had enough and all thoughts were of sleep. So that was it, only a few small fish but at least I had a keeper dab and had got my target of the sole, so not too bad a night, all things considered. Although conditions haven’t been too good of late, with flat sea and may rot. Anyway, I decided to have a play at Seaford last night to see what was around. No point in trying for bass looking at the forecast and having seen the flat sea, so I opted for a one rod and worm bait policy. Shot down to Brighton Marina during the day and got some really good quality black lugworm from ‘The Tackle Box’ which would do the job and produce two baits from one worm. 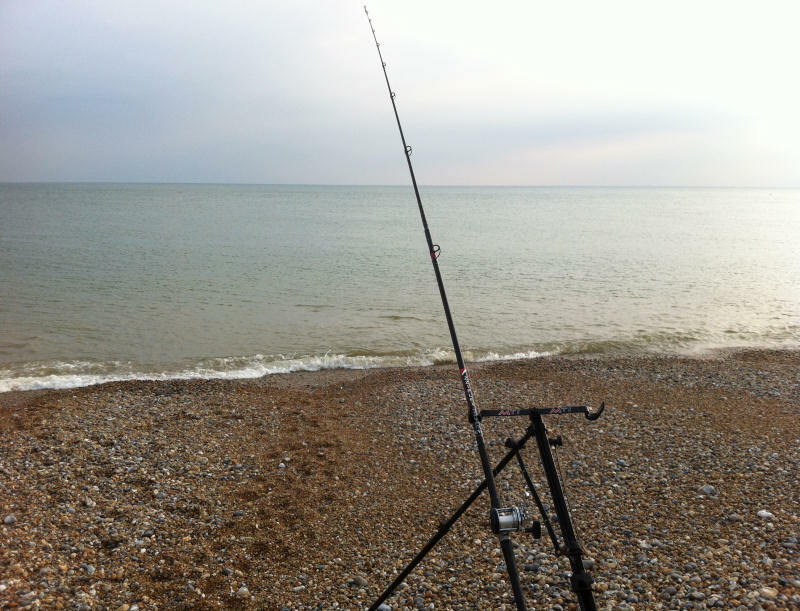 I wanted to fish from low up to high water, so arrived at Seaford beach around 6pm to find a millpond like sea which was pretty clear apart from some huge patches of rot that stained the water and made it look like ‘orrible weak tea that you would get from a staff canteen. You can just about make it out in the photo (click on it for a bigger picture). Not to be deterred, I set up the one rod with a size 2, two hook flapper baited with the fine blacks I’d got and shot it out at distance and settled down to wait. It was quite a pleasant evening to be out with just a bit of a chilly breeze coming in from the back of the beach. Now I normally where floaty trousers whenever I’m out – not for any safety reason but purely because it keeps my jeans clean and has loads of pockets to keep stuff. I have to say though, that last night they nearly came off because it was so warm – the old man vegetables were certainly roasting in their cosy nest. First fish arrived at one hour after low water and was a small micro dab that had wolfed down the worm. Release, re-cast and fifteen minutes later the rod tip went and another small dab hit the beach. This went on pretty much for the next couple of hours or so; a dab every fifteen minutes with a couplf double shots in there too – just a pity they weren’t keepers! Once darkness fell, the dab went off the feed and were replaced with a sprinkling of pin whiting and pout. I started kicking myself for not bringing the bass rod and not being able to put out a live bait as well. By about 11pm, I’d really had enough, my back was screaming for horizontal rest and all I was getting was damn pin whiting; there was just no point in wasting time and quality bait on them. at least I’ve got a few left over and so I may well have a dabble tonight as well to use them up. Having spent the last few sessions chasing plaice and herrings at the marina, I thought I’d have a change, so headed out to Seaford beach after work last night. Few would believe it but one of the reasons was to get a dogfish for my species list. The main reason though was to prospect for any bass that might be in, so the only bait I used was frozen launce. I had contemplated taking some worm baits but thought better of it, as it would probably have meant picking pin whiting and slugs off the hooks every five minutes – not my idea of fun! I arrived on the beach at about 8.30pm – about three and a half hours before high water. Weather-wise, it was a very still, clear night with no wind to rough up the calm sea. After the warmth of the day, it was actually a bit chilly and I was glad of the jacket I had nearly left at home. I used two rods with similar rigs, both using a running ledger but one was fished ‘up n over’ style for extra distance. Both rigs ended in 4/0 hooks that matched the size of the launce perfectly. So with two baits out – one at distance and one in reasonably close, I had a coffee and waited. Looking up and down the beach, I saw a few lights a bit further West by the Beachcomber, some even further West somewhere near Edinburgh Road, I guess and some East, up past the Martello end of the beach. 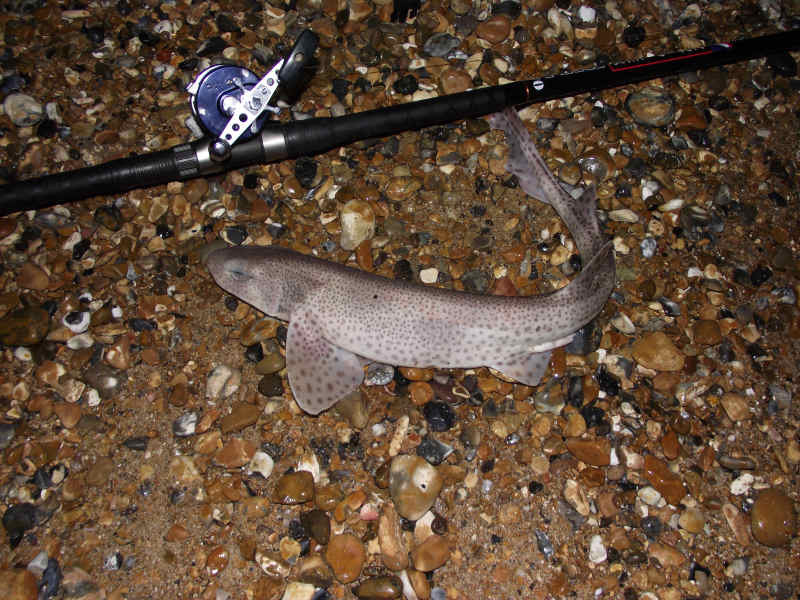 At about 9pm, there was a nod on the distance rod and the first fish of the night was on the shingle and one of my targets for the night, a plump doggy (lesser spotted dogfish or LSD for short) of 1lb 14oz as measured on my scales. Not long after it was released, it showed up on the shingle again; I wonder why, they nearly always seem to swim back up the beach. It was released again – this time a bit further out and as I didn’t see it again, I presume it managed to re-engage it’s satnav and find the right way to go. While all this had been going on, I hadn’t noticed the close-in rod bouncing away merrily which, on retrieve, produced another doggy. This one was smaller and actually managed to find it’s way back into deeper water. The next two casts on the distance rod produced two pin whiting which had somehow got themselves hooked on the big baits. It then went quiet for some time until about an hour before high water, when the close-in rod bagged another doggy, which was somewhere in between the other two size-wise. There then followed a succession of small whiting an few pout just on high water before it went dead again. By the time 1am came around, I couldn’t stop yawning and the thought of a warm bed overpowered the thought of maybe ‘a few more casts’. I packed all the gear away and suddenly thought; I’ve only got one more week of work and then it’s a month off for the Easter break (ya just got to love working for a school) and loads of fishing to be done – woohoo! There’s not been much to write about of late, generally only whiting and rockling fests in the dark hours and pretty much blanks in daylight. One can only write so much on whiting before it gets really – and I mean really boring. Since I wrote last, I’ve done nine sessions; four during darkness and five in daylight, all on Seaford beach, either at West View, Beachcomber or The Buckle. The only half reasonable daylight session was Today’s which was a quick three hour bash over high water at The Buckle. Even then it was pretty dire and was only a quick test before Saturday’s Flattie competition being run from WSF forums and organised by ‘Fishyrob’. I managed to get two dabs out (one keeper) and the skinniest whiting on some minging sticky black lugworm presented on a size 4 two hook flapper. Going by that result, I reckon the competition could be bloody hard work but no doubt the hardened match men will eek out a result. The only other thing of note to happen, is that I’ve somehow managed to contract Bell’s Palsy, so now not only do I have a completely trashed back and its continual pain but I also look like some sort of Hammer House of Horrors lab assistant. It’s no fun I can tell you, can’t close one eye, have to slurp my drinks and can’t even do that without spilling it out of my slack mouth. Eating is pretty much the same story and doesn’t make for pleasant viewing. Don’t know how long it’s going to last; doc says, could be days, weeks or even months – oh great bells of joy! Current treatment is a shitload of anti-viral and steroid meds which are making me feel like crap.